PS160 is an immersive architectural installation that takes place inside The Clemente Soto Vélez Cultural Center. Created by artist Gabrielle Mertz and commissioned by Artists Alliance, the project employs a choreographed series of light and sound projections located throughout the Clemente building to construct a performative experience of the architecture. The installation references structural and design elements of the Dutch Neo-Gothic landmark, as well as the building’s history within the Lower East Side neighborhood, original function as a school, and later use by artists and community members. Drawing on her background as a professional choreographer, Mertz constructs a site-specific experience that places the architecture of the building at center stage and in the role of performer. Audiences will be able to explore the building’s performance at will, guided by the subtle influences of light, sound and site. Over the course of one year, Mertz composed an original score in homage to life both inside of and immediately surrounding the Clemente building. Captured recordings include the ambient noise of artists working in their studios; traditional Chinese musicians in a nearby park; West African master drummers teaching a class; the artist playing violin in the Clemente stairwells; tango dancers and musicians getting ready backstage; school children, families and business owners in the neighborhood; pigeons and crickets living on the corner of Suffolk & Rivington; and the creaking wooden floorboards of the 120 year-old hallways. Woven together to create a sonic history of the structure, these aural elements build towards a full orchestration of time, past and present, that waxes and wanes as one makes his or her way through the space. As the PS160 soundtrack gives form to air, Mertz’ series of light installations and interventions reorient visitors’ relationship to the architecture itself. Mertz employs a range of light sources—incandescent, fluorescent, LED, ambient, color gels, moonlight—to construct deliberate vistas that re-frame the sense of place within the site. By adapting existing fixtures and adding some of her own, Mertz dismantles the perception of space in order to give visitors’ access to their own experience of the building’s construction and relationship to the neighborhood. Similar to much of Mertz’ practice, PS160 dissects the elements of performance—light, sound, space, bodies in motion—to consider the limitations and expansiveness of the discipline and to question the connection among the elements of performance. PS160 achieves a delicate and remarkable balance of parts, affording visitors the opportunity to slow down and absorb their own sense of place. For many living in or visiting New York, the physicality and mythology of the city’s iconographic buildings often imposes itself on one’s experience from the street. PS160 brings awareness to this presence, while transforming the landmark building into an instrument of performance. PS160 refers to the building’s former life as Public School 160, the name conferred by the New York City Board of Education’s Committee on Buildings upon construction in 1897. 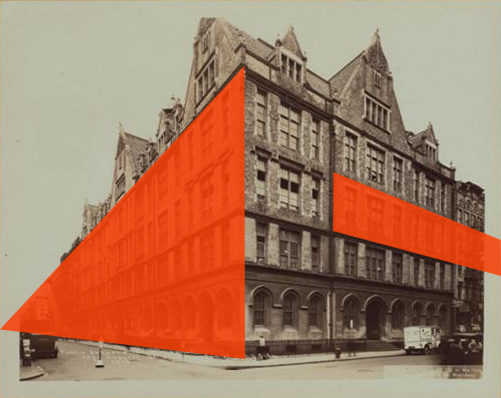 The project also celebrates the 50th Anniversary of the New York City Landmarks Preservation Law, which helped to catalyze the architectural preservation movement in the United States. PS160 is free and open to the public. Visitors should be aware that the installation is located throughout The Clemente, a five-storied building without elevator access. In the case of inclement weather, the rooftop portion of the installation will remain open. Kara Nandin, Zoé Fornara, Katie Ahladas, Léa Lascaud, Mark Power, Bill Massey, and everyone at Artists Alliance; Julio Arcenegui, Jan Hanvik, Tal Sharon, Jaime Buenaño, Danny Rodriguez, Becca Weiss, Mariana Ortiz, and all of the staff & board at The Clemente; Adam Cieply, Jackson Herndon & Patrick Rickerfor of White & Case; Jennifer Sage & Christina Draghi of Sage and Coombe Architects; André Escarameia and Rooster Gallery; Mark Addison Smith, Cat Del Buono, David Kagan, Lisa Hamburg, Jonathan Goodman Levitt, Freya Powell, Yohanna Baez, Man Bartlett, Elizabeth White, Henry Parham, Sue de Beer, Drew Jackson, Nora Lee, and Chris Heller. I am engaged by the power of spaces. These spaces can be inside or outside—buildings, highways, forests, theater stages—but the specific structure of each space always exerts a unique influence on how people move and what they feel in that environment. I am interested in how audiences experience a space and in the eye of the viewer in such a context. My work is concerned with movement patterns and structural relationships and in the physical and psychological effects of spatial elements. I often use light, sound, video, projection, or other forms to amplify and reinforce the elements of a space and to expose the choreography inherent in a specific environment. With PS160, I was intrigued by the Clemente building’s function and use over time and the sense of layered history that is clearly visible in the hallways, stairwells, and walls. The building’s architectural details and layout, both original and altered through the years, exert a dramatic force on the viewer and suggest a composite narrative. Through this project, I hope to peel back some of these layers and place the building at the center, allowing the architecture to act as both performance and performer, stage and dancer. Gabrielle Mertz is a visual artist and choreographer. Her practice explores spatial and movement structures through the incorporation of sound, light, dance, video, and photography. Drawing on her formal training as a dancer and choreographer, Mertz creates installations, performances, and other site-specific works that expose or reimagine architectural and environmental spaces. Previously the Founder/Artistic Director of Ondine and Company, she created dance performances and site-specific installations on stage and on tour. Her work has been exhibited in the United States and Europe at the Cultural Center of Krakow, New Museum Ideas City, High Museum, International Dance Festival, Rialto Center for the Performing Arts, American Dance Festival, 7Stages, King Plow Arts Center, and The Performance Space, among others. She is the recipient of commissions/awards from the Cultural Olympiad, City of Atlanta, Bureau of Cultural Affairs, Georgia Council for the Arts, and Center for Puppetry Arts, among others. She has taught/ lectured at New York University, Bruce High Quality Foundation University, Emory University, and Image Film & Video Center. Funding and support for PS160 has been provided by the Netherland-America Foundation, Artists Alliance, and The Clemente Soto Vélez Center .